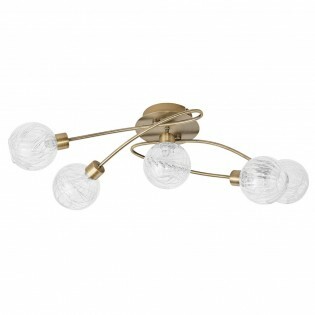 Alemar, modern, avant-garde and designer lighting. 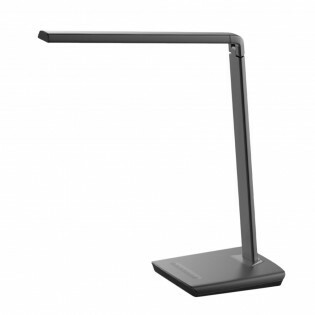 Flexo Click with light LED adjustable in six levels of intensity (tactile regulator), made of black acrylic and with USB input for you to charge any device quickly. Adjustable head for you to direct the light according to your needs. Ideal for illuminating your desk table or modern-style bedroom.Dimensions: High 45 cm. Length 45 cm. Width 16 cm. Berber-inspired lamp with a metallic lampshade finished in brown, with a dome-like shape forming drawings and multicoloured glass embedded to form drawings. Very nice to illuminate of casual and colourful spaces such as living rooms, dining rooms, bedrooms, shops or cafés. Ideal for combining several. Dimensions: High 20-120 cm. Diameter 25 cm. Berber-inspired lamp with metal lampshade, cylindrical shape forming drawings and transparent glass copens interspersed and hanging from the bottom wall. Nice finish for Lighting of spaces decorated in white such as living rooms, bedrooms, shops or cafés. Ideal for combining several. Dimensions: High 20-120 cm. Diameter 15 cm. 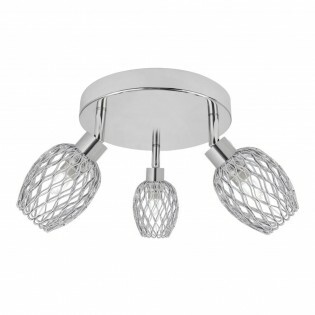 Ceiling flush light Arne of a Modern Style with a large circular support made of chrome-plated metal and three net-shaped lampshades designed to allow light to pass through easily. You will be able to direct the lights to the point you need. Ideal to illuminate living rooms, bedrooms... Dimensions: High 16 cm. Length 37 cm. Width 37 cm. Ceiling flush light from the collection Arne. Spectacular design with wavy shapes and five lighting points that you can orient as you like. Its design is original and eye-catching with light points housed inside metal meshes. Ideal for use in dining rooms, living rooms... Dimensions: High 19 cm. Length 80 cm. Ceiling flush light with 5 lights. 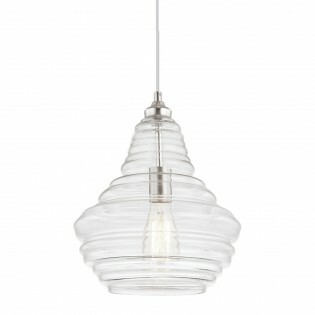 Modern style, with a chrome or leather finish and rounded glass lampshade. Perfect for lighting passageways such as hallways, living rooms or bedrooms. Dimensions: High 20 cm. Width 65 cm. Ceiling flush light from the collection Átomo consisting of three lights, metal grid and crystal lampshades and metal main frame with chrome or leather finish, available to choose from. Perfect for lighting modern rooms: living room, dining room, bedroom, etc.Dimensions: High 18 cm. Length 40 cm. Width 40 cm. 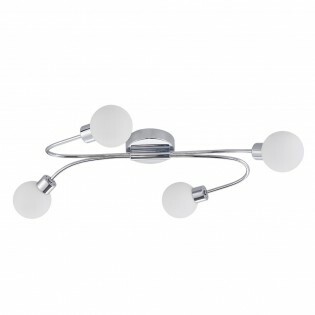 Ceiling flush light Ball modern style, minimalist lines and lighting points that you can configure as you need. The ball shaped cups are made of glass and the structure is made of chrome-plated metal. 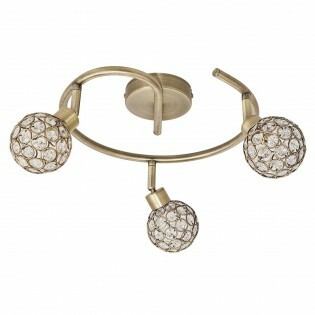 Ideal for lighting all types of rooms.Dimensions: High 12 cm. Length 59 cm. 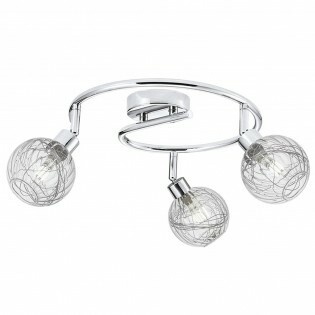 Ceiling flush light Ball with six lights, circular wall bracket, straight-line metal arms with a chrome finish and white crystal ball-shaped lampshades. It is perfect for lighting homes with a minimalist touch: dining rooms, bedrooms etc.Dimensions: High 24 cm. Length 53 cm. Width 53 cm. Ceiling flush light from the collection Bridymade of metal and available in two finishes: leather or chrome. It is a simple and discreet design, small in size, ideal for lighting all types of rooms.Dimensions: High 11 cm. 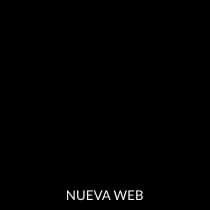 Length 9 cm. Width 9 cm. 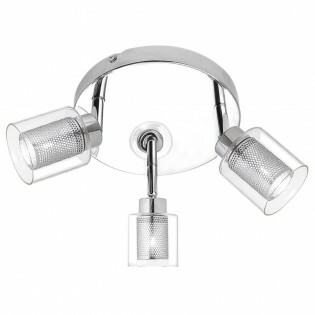 Ceiling flush light Celda of modern style made up of three lighting points. The original design of the lampshades, double structure, metal interior and glass exterior stand out. 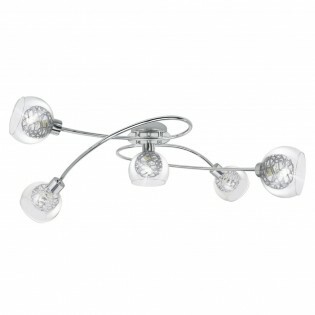 Ideal for illuminating rooms such as the dining room, living room, bedroom, etc. Dimensions: High 15 cm. Length 30 cm. Width 30 cm. Ceiling flush light Celda modern style with curved lines linked to each other, metal fabrication with chrome finish and six lighting points in glass and metal tulips. 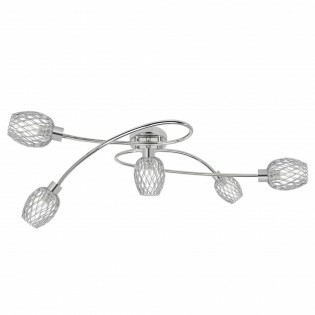 Ideal for providing great lighting for dining rooms, living rooms, bedrooms, etc. Dimensions: High 31 cm. Length 44 cm. Width 44 cm. Ceiling flush light Floki with five light points that you can configure in the position you want. They have a double lampshade, one made of glass and the other with a net structure. It is made of metal and is available in two colours: brown or chrome. It's a deal for modern rooms.Dimensions: High 20 cm. Length 83 cm. Flush Light Rolo modern, three adjustable light points with glass lampshades decorated with metal threads and metal structure available in two finishes: chrome or leather. Its minimalist and modern design is ideal to illuminate the table of your dining room, living room...Dimensions: High 16 cm. Length 42 cm. Width 42 cm. Flush Light Rolo of five lights, made of metal with chrome or leather finish and lampshade made of glass with metallic threads inside. Each light can be directed to where you need it to get a more precise light.Dimensions: High 20 cm. Length 63 cm. Width 20 cm. 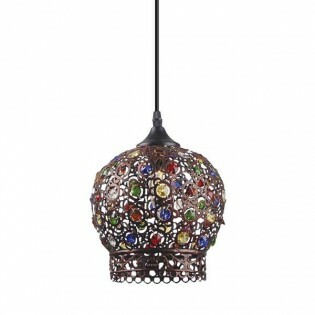 Pendant lamp Agadir with Arabic-inspired style. It is made of metal with a white finish and decorative crystals. The crystals form a figure of flower, providing a different light effect. It is an ideal ceiling lamp for a living room, bedroom and large areas of your home. Dimensions: Heigth 20-120 cm. Diameter 25 cm. Pendant lamp Garil of rustic style . The textile lampshade in beige with details of rope in the fabric, combines perfectly with the rope that holds the shade and reinforces the rustic style of this lamp. It is ideal for use in living rooms, dining rooms and can be used in restaurants and hotels. Dimensions: Heigth 130 cm. Diameter 45 cm. 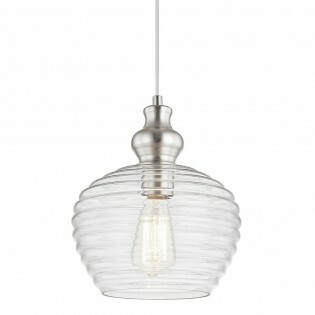 Retro style pendant lamp Ingen. It is ideal for lighting halls, dining rooms and suitable for restaurants and hotels. The shape of the lamp resembles the rim of a cart wheel and is made of black metal. The bulb you place is completely uncovered, so it is highly recommended to use a decorative LED bulb.Dimensions: Heigth 15-150 cm. Diameter 20 cm. Pendant lamp Lonial . The ceiling rose and the fixing of the lampshades is made of metal with brown finish that contrasts with the chromed metal details. It has circular textile lampshades, which are arranged in line. It is a ceiling lamp that will look great on the dining table and in hallways.Dimensions: Heigth 47-175 cm. Length 80 cm. Width 20 cm. Ceiling lamp Lumpur of retro style . It is available in satin nickel and leather finishes, appreciated in the glass lampshade and the ceiling rose. Its retro-vintage style fits perfectly with rooms such as living rooms, dining rooms, kitchens and bedrooms.Dimensions: Heigth 30-130 cm. Diameter 25 cm. 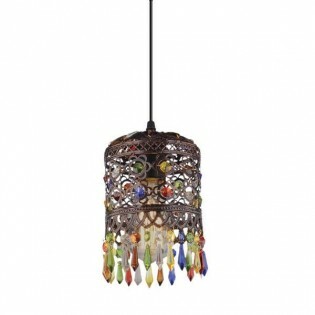 Pendant lamp Meralda , made of chrome metal and small crystals. The pieces of glass are framed within two rings of chromed metal of different thickness. Their modern design, which unites the concept of crystal lamps with chrome metal, will light up your living room, dining room or bedroom.Dimensions: Heigth 30-130 cm. Diameter 30 cm. Rustic ceiling lamp Nilo, made with brown thread interlaced in a metal grid. This lamp has a unique lighting effect by contrasting the dark colored string with the light passing through the interlace. It is perfect for lighting your living room, dining room and bedroom.Dimensions: Heigth 30-130 cm. Diameter 25 cm. 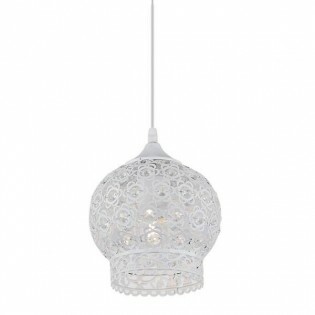 Ceiling lamp Orbe with glass lampshade . The spherical lampshade has a relief of small points, which create a different lighting effect. It is an ideal pendant lamp to place in living rooms, dining rooms and bedrooms.Dimensions: Heigth 37-137 cm. Diameter 30 cm. Rustic pendant lamp Otta made of white rattan. It has an oval shape and the use of rattan creates a very interesting lighting effect by letting light through the threads. You can place it in your living room, dining room, kitchen and bedroom.Dimensions: Heigth 30-130 cm. Diameter 45 cm. 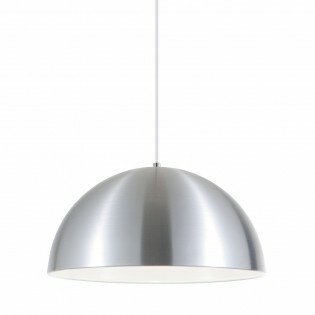 Modern pendant lamp Palladium. 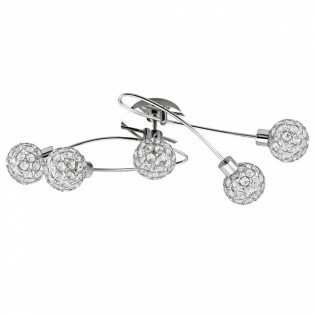 Spherical in shape and composed of small octagonal-shaped crystal copens, they are held in place by a chromed metal frame. You can place two or more ceiling lamps together to create a different effect, it is ideal for placing in living rooms, dining rooms and bedrooms.Dimensions: Heigth 18-180 cm. Diameter 18 cm.